My recent soup craze began on Sunday as the weather well and truly turned cold. I had a go at making this recipe, originally from Delicious Magazine and I really couldn’t believe how easy it was. To make it go further, I doubled the recipe and in total, it cost less than $7 to make. My non-soup loving husband confessed (with a smile) that even though serving him cauliflower soup was “pushing it”, he actually quite liked it! The quantities in this recipe serves 6. Preheat the oven to 200°C. Line 2 baking trays with foil. Heat 2 tbs oil in a large saucepan over medium heat. Add celery, onion and garlic, then cook, stirring, for 3-4 minutes until softened. Add the potato, chicken stock, bay leaf and three-quarters of the cauliflower, bring to the boil, then reduce the heat to medium-low and simmer for 12-15 minutes or until cauliflower and potatoes are tender. Remove from heat, cool slightly, then transfer to a blender and blend until smooth. Stir through the cream and 1/2 cup (40g) parmesan. Season to taste. Meanwhile, place the bacon and remaining cauliflower on one of the lined baking trays. Season with pepper, then drizzle with remaining 1 tbs oil and sprinkle with 2 tbs parmesan. Roast for 10-12 minutes or until crisp. Put the bread rolls on a separate tray, sprinkle with remaining 1/3 cup (25g) parmesan and bake for 2 minutes or until golden. 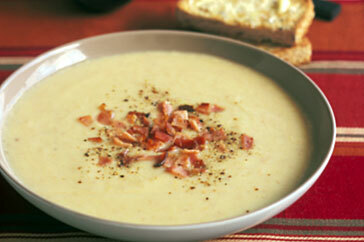 Divide soup among 4 bowls, then top with crispy cauliflower and bacon. Sprinkle with nutmeg and parsley, drizzle with oil and serve with bread rolls. I’ll vouch for this recipe – our kids loved it too!